Apple is expected to unveil three new 2018 iPhone X smartphones this September: a 'cheap' one, a large one and a Mk 2 of the current iPhone X. 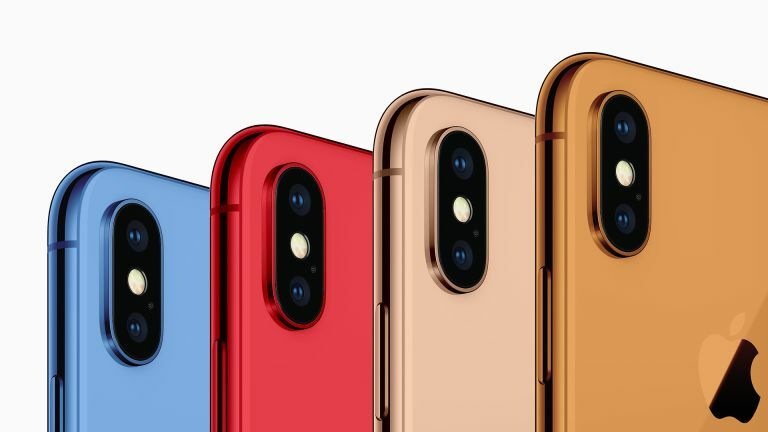 This is the first time the company will have released three new iPhones models at once and it looks like one key differentiator will be new colours, one of which just got shown off in new images. It has been suggested – and it seems logical to us – that Apple will take a similar approach to the cheap iPhone X as it did to its last more affordable new handset, the iPhone 5c, with bright colours making it clear to everyone that you are either a discerning shopper who values fun and cost-effectiveness over gimmicky new features. Or that you are a tightwad, or you just can't afford a 'proper' iPhone X. Analyst, Apple specialist and frequently-mentioned-here analyst Ming-Chi Kuo states in a new report that Apple plans to release the flagship 6.5-inch iPhone with an OLED screen in classy black, eye-catching white and a dripping 'new gold'. The affordable 6.1-inch LCD iPhone, by contrast, should come in inexpensive grey, basic white, and three primary colours, like you might find on Lego bricks: blue, red and orange. This sounds similar to when Apple launched its budget, plastic iPhone 5c models in similarly eye-catching, matt colours. The red model could refer to the PRODUCT(RED) line which Apple generally releases a few months after the initial phone launch. Now iDesigner has created a concept of what the iPhone X for 2018 could look like in blue. As you can see it's a muted blue that offers the typically classy finish that you'd expect from Apple. It's not gold though, is it? The new gold colour is expected to be saved for the higher end phones. This has leaked before in FCC images for prototypes of the iPhone X. The report also suggests some prices for the ranges, with the top end, 6.5-inch OLED iPhone X Plus at the $999 (probably £999) mark that the current 5.8-inch iPhone launched at. The affordable 6.1-inch LCD model should be closer to $700 (also likely still £700) – which is not actually all that cheap, really. There should also be a refresh of the current 5.8-inch OLED iPhone X with a price somewhere in between.